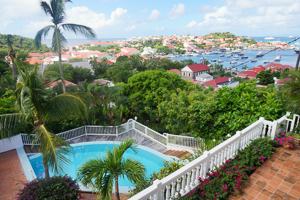 Villa UJV 381 (Colony Club A) is an apartment located in the Colony Club complex in Gustavia, St Barts. It faces the harbor and is conveniently located in the heart of town, close to the luxury shops, restaurants, and nightlife. This one bedroom apartment is nicely decorated with rattan furniture and all white décor. UJV 381 is fully air-conditioned. The Queen size bedroom and ensuite bathroom are located upstairs. The small private terrace overlooks the common pool nested in a lush, tropical garden, and offers a beautiful view of the harbor with great sunsets.